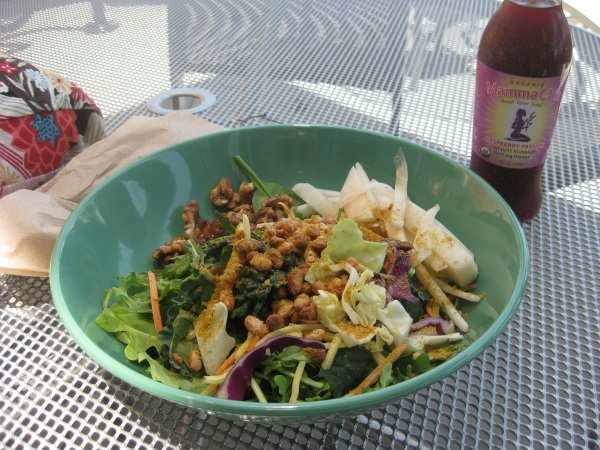 Since the weather is so nice and I felt like splurging for lunch, I headed to Whole Foods to enjoy a salad outside. Because my job can be stressful, I like to sneak away from the office for lunch to a peaceful, more relaxing eating environment. Granted, that can be a mixed bag at Whole Foods and thankfully it wasn’t today. My haul only came to $6.50, impressive considering I splurged on chia-seed drink. 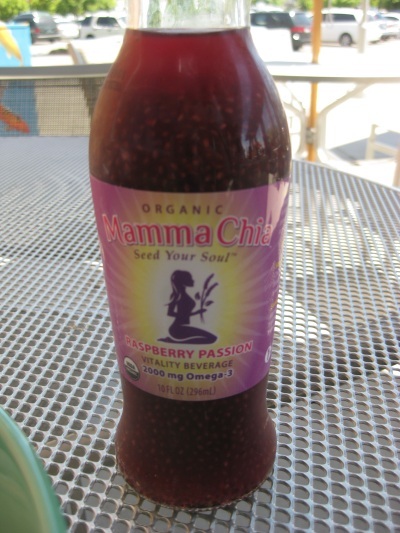 Since it was on sale for $2.50, I couldn’t resist trying Mamma Chia Raspberry Passion. It’s a fruity drink with chia seeds in it promoting a tapioca like texture and health benefits and omegas found in chia seeds. I’m a fan of chia seeds, chia seed pudding has grown on me so much that it’s one of my favorite raw weekend breakfasts. But I’m not sure about drinking them. While the drink itself was good with a very sweet raspberry flavor, trying it on a hot day while sitting outside was not a great idea since it wasn’t very thirst quenching. Even with the moist salad, I still drained my water bottle when I got back to the office. And it’s not low-cal, the bottle is 110-calories. Maybe this would be a good fast breakfast on the road, but not a cheap one. I’ll stick to adding bulk chia seeds to smoothies and enjoying them in pudding form. And since it’s WTF Thursday, I raided my pantry to come up with something for dinner. Usually by Thursdays, there’s not much left for fresh ingredients in my kitchen and I usually end up using what I can. This can be good or completely disastrous. Tonight was somewhere in between, closer to good. 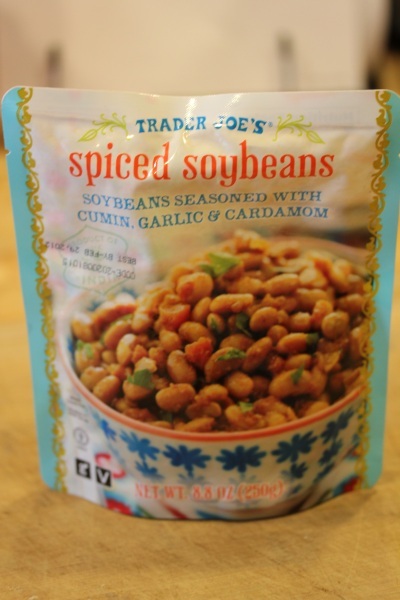 :-) I started with something I grabbed at Trader Joe’s a few weeks back – a cooked, 2-serving pouch of Spiced Soybeans. The simple list of ingredients, quick prep time, and cheap price caught my eye. As with most soy products, it’s fabulous source of protein and fiber. 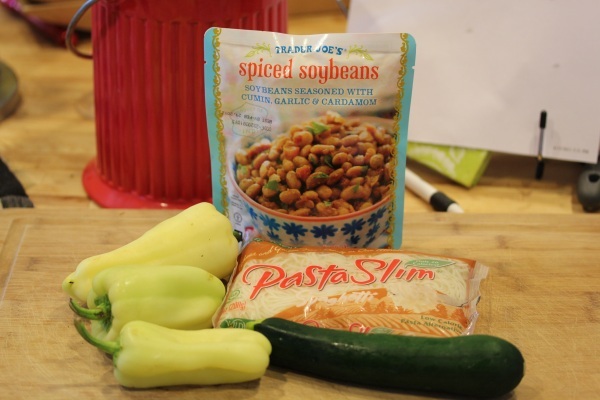 Sadly, there wasn’t much else in my fridge, so this is what I grabbed to work with – the soy beans, PastaSlim noodles, yellow peppers I got in last weeks farm box that are, uh, lacking in the flavor department, and one lonely zucchini. The soybeans smell and look a lot like spicy, vegan taco filling. The cooking instructions on the bag recommend cooking in the bag either in a microwave or stove top in boiling water. But I didn’t feel comfortable heating the disposable packaging and dumped them into a skillet to cook with the rest of the ingredients. 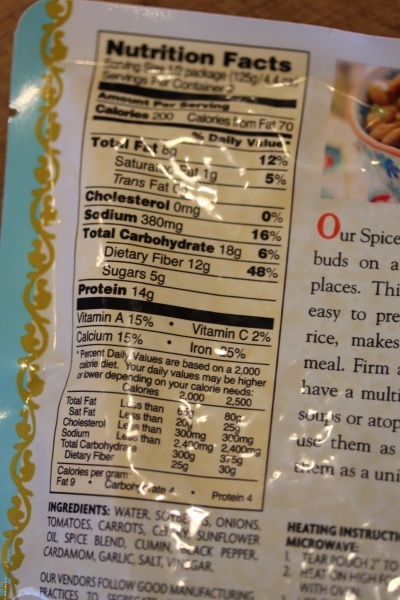 For non-dairy, it shreds nicely and packs a mild spicy kick that worked well with the spices in the soybeans. My WTF Thursday dinner is complete after only 10 minutes, great after a busy day! 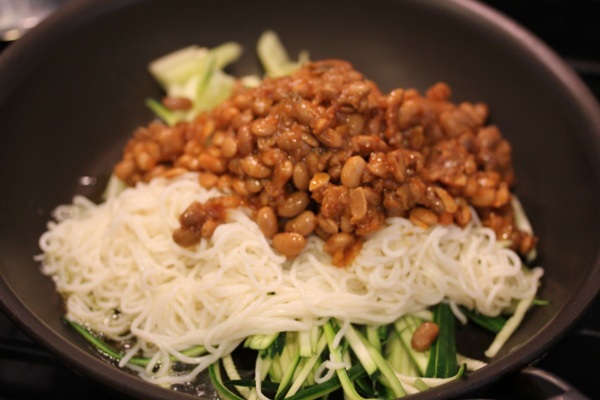 For a quick meal that looks delicious…but how on earth can you stand the taste/texture of shirataki noodles!?!?! No matter how I cook them I have never been pleased with the result so I stopped buying them altogether. Have you tired kelp noodles? They are more palatable in my opinion and are raw! I like the WildWood PastaSlim noodle texture better than House Foods Shirataki noodles, they’re not as rubbery and soften better to a pasta-like texture after cooking. The texture on the House Foods noodles always seemed a little off to me. 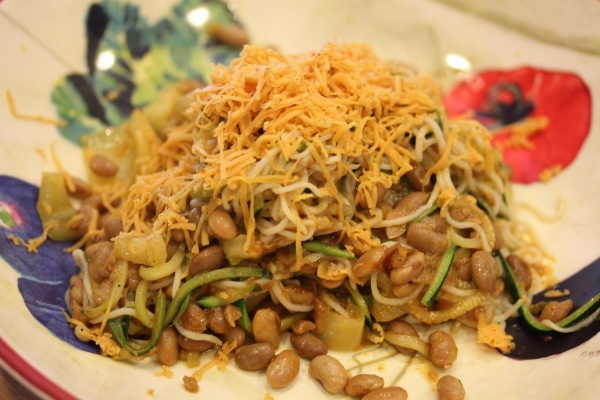 I’ve had kelp noodles, but not recently because their texture was a little too crunchy to me when I tried them. I need to try them again with a creamy hemp sauce. 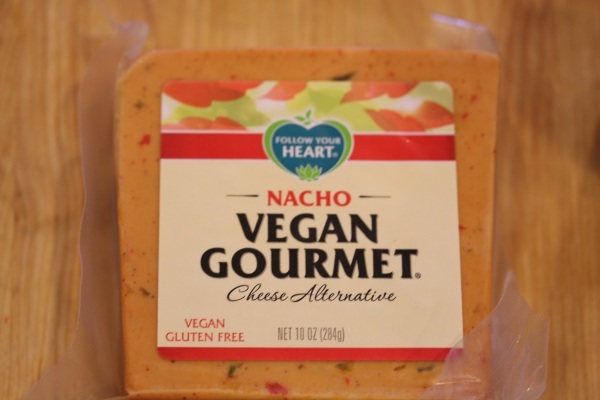 ohmygosh i want that nacho vegan cheese in my life!!!!! <3 the chia drink sketches me out… i like stuff like kombucha b/c its not super sweet so i'm not sure i could handle that baby! Wow great use of the cheeze and the beans…you made vegan tacos in 10 mins. And thanks for the review on the beans. Have seen those but never bought them. Same actually for the cheese. I have never tried it but good to know it shredded and was tasty! Yeah, that chia drink sounds a little sketchy. Of course, I’m not a big fan of tapioca balls either! i have never tried those soybeans but they look good! I actually just got a donation for those Mamma Chia drinks for a charity auction that I am doing right now. That’s great, what nice donation! I will try the other flavors, this one had a great flavor.